Coyotes goalie Thomas Greiss, with the help of Gilbert Brule, blocks a shot by the Ducks' Teemu Selanne during the first period Saturday in Anaheim, Calif.
ANAHEIM, Calif. — Although the Anaheim Ducks blew a two-goal lead in the final minutes of their return from the holiday break, Saku Koivu made sure their franchise-record winning streak kept rolling along. Koivu scored two goals, including the game-winner 51 seconds into overtime, to lift the Ducks to their 10th straight victory, 3-2 over the Phoenix Coyotes on Saturday night. Anaheim improved its NHL-leading record to 28-7-5 and went to 14-0-2 at Honda Center this season, but only after Martin Hanzal and Keith Yandle scored late goals to earn a point for the Coyotes. "We try to forget what happened," said Koivu, who had three points. "We had a 2-0 lead and they got a lucky bounce on the first goal. It’s one of those things where you try and regroup as quick as you can. You knew there was a good chance there would be overtime, so you start, so you start thinking about that." The Ducks are the only team in the NHL this season not to lose at home in regulation, and they’re seven points ahead of Los Angeles atop the Pacific Division. They also have a 13-game points streak (11-0-2), three shy of the club record. "I think it’s neat," Ducks coach Bruce Boudreau said. "Any time you can be a part of something nobody else has done, I think it’s a special occasion." "For 55 minutes we were really good and we felt we weren’t giving them much," Cogliano said. "Then they got the odd goal and we let down a bit, but the bottom line is we got the win." The Coyotes have lost all four meetings with Anaheim this season, but they made a furious late run at the Ducks. 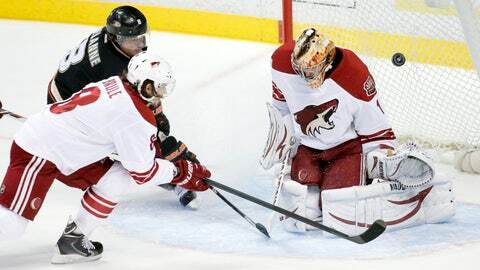 Hanzal cut the lead to 2-1 with 4:34 left after the puck caromed off the boards behind Jonas Hiller. "We got a break off the glass and it was nice to see us capitalize on it," Phoenix coach Dave Tippett said. With goalie Thomas Greiss pulled, Yandle scored the game-tying goal with 44 seconds left. "It shows that we don’t give up," Yandle said. Hiller stopped 23 shots and improved to 17-4-4, matching Viktor Fasth’s franchise record with his eighth straight victory. Anaheim has held its opponents to two or fewer goals in nine of the 10 victories during the streak. After yielding the first goal in each of their past five games, the Ducks got on the board first on a short-handed goal by Koivu in the first period. The veteran Finnish center skated into the Coyotes’ zone and blasted a slap shot from the left faceoff circle past Greiss. "We just kept at it, worked really hard and just kept coming and never gave up," Greiss said.